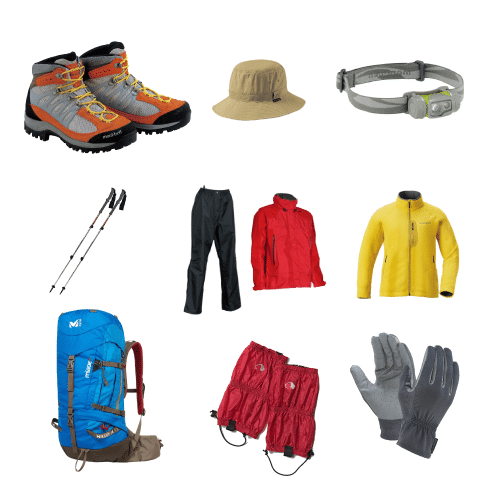 Why hiking gear is necessary? 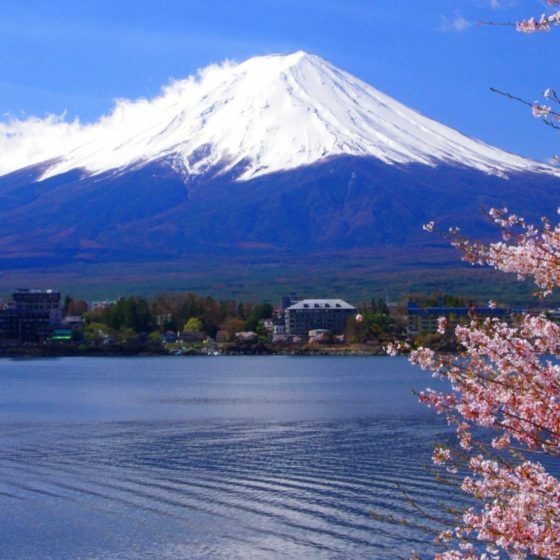 Since Mount Fuji has entitled as UNESCO World Heritage site, more and more people from all around the world have been visiting here in summer. 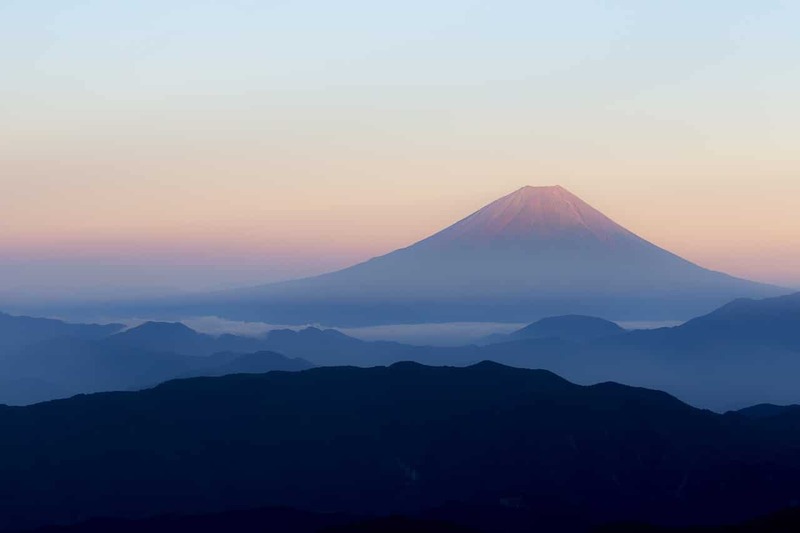 Mount Fuji is open to public ONLY in summer and it is easily possible to climb in summer if you prepare enough and you will really enjoy the highest mountain in Japan, however again You need good preparation. Some people just try to get there with half-pants with T-shirts, even with flip-flops that is not appropriate for climbing Mt.Fuji because of safety reason. Also it is very important to know that Mount Fuji is a volcanic mountain and there is a possibility of eruption. So nowadays people who are guarding the UNESCO site will ask you to get prepared before you really go into there. If you are considered as less prepared for trekking Mt.Fuji at the first check point(Mt.Fuji safety guidance center), unfortunately you will be rejected to enter climbing area for your safety. So you are always required to have enough trekking equipment to prove yourself that you are well prepared. It is for you. It is for your safety. Here is the equipment list that you can rent from us. You will need all of them to prepare yourself. You can also substitute with other item to protect yourself in mountain. Our Rental gear have been neatly maintained and they have been very much satisfied with not only Japanese customer but also customer from all over the world. For detail and description and size chart, click the each picture. You will be connected to our rental gear page. 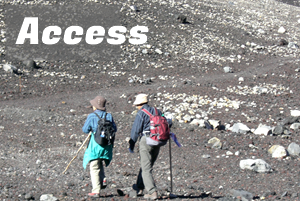 Most of the trail of Mt.Fuji is covered with volcano ash, so it is difficult to walk with your normal exercising shoes. It is better to use a pair of good shoes, especially hiking shoes because the sole of those shoes are made to have enough power to grip unstable ground. Also, it is recommended to choose High or Middle ankle hiking shoes to keep your ankle stable, that's prevent to have your ankle sprained. The weather in Mt.Fuji is very much changeable. Rain jacket is a MUST item for climbing any mountain. Especially it is recommended to use separated type rain wear (Rain Jacket and Rain trousers), because it protect your body more than Poncho type. 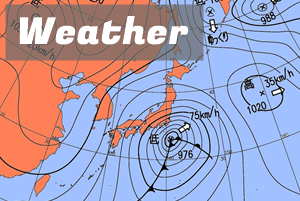 Poncho type rain wear cannot be used in Mt.Fuji because of the strong wind comes from everywhere also from your bottom, so it makes you really wet. On the contrary, separated type rain wear perfectly cover your body and prevent from rain coming inside of your rain wear to make you wet and to make your body very cold. Rain wear can also be used to protect your body from wind. Wearing your fleece jacket under your rain jacket makes you really warm. Our rental rain wear is trusted Japanese brand, has lots of good review from mountain climber from Japan. Also the brand is the only outfitter for ENSA,Ecole Nationale de Ski et d'Alpinisme, very much well-satisfied with the quality. A pair of gaiter are attached for free if you rent our rental rain wear. Gaiters always have to be used with your rain trousers to prevent any sand or small stone coming into your shoes. Rain jacket , Rain Trousers and a pair of gaiters are coming altogether as 1 set item. 30L volume backpack is enough and is recommended for climbing Mt.Fuji. You do not need to bring any sleeping equipment like a tent because it is forbidden to set up a tent in Mt.Fuji. Minimize your backpack to reach the summit. Rain cover for backpack is also necessary. Our rental backpack include rain cover. The variable electric item like mobile phone or digital camera are recommended to put inside of zipper type plastic bag. 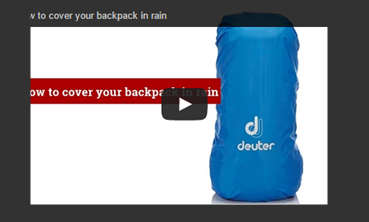 Even with the rain cover, some part of the backpack can be wet and your important items can be damaged by rain. The temperature after station 8 will about freezing point. So any warm jacket with long sleeves is a MUST item. Fleece jacket especially for climbing has some advantages like quick dry system and heat retaining function. Soaked Jacket with your sweat or rain is not only gaining the wight of your belongings but also removing your body temperature to make you very cold. It is recommended to use 2 trekking pole, 1 Pole for each hand. Climbing with pole automatically balancing your body, it ?relieve the heaviness and tiredness against your feet. If you are not exercising regularly, these poles are helpful to make your way to the summit. Glove will be very helpful not only protecting your hands from cold but also the function of climbing. 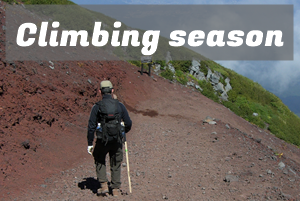 There are many rocks in Mt.Fuji, you sometimes required to use your own hands to climb up or down. Also it is better if the glove has heat retaining ?and water prove function on its material. During daytime, the heat from the sun is very hot. To prevent from heat sickness, you need something to cover your head from the strong heat. If you are planning to see the sunrise at the summit of Mt.Fuji, you must bring a lamp. To see the sunrise, you are required to leave a hut around 1:00-2:00 in the very early morning. So you need any lighting system in dark trail to make yourself to the top. Even if you are not planning to see the sunrise, it is recommended to bring a lamp to make your way back to station 5 safely. You might not be able to be back before sunset or you might not be able to walk because of injury. So the lighting system is very helpful. We see some people without any lamp, it is very difficult to walk back in the darkness.Do not forget to bring spare battery!Our rental headlight are carefully checked before we send and a spare battery is attached with. Lightweight Nylon fabrics Stretch hiking pants offer comfort whole time while you are on hike. 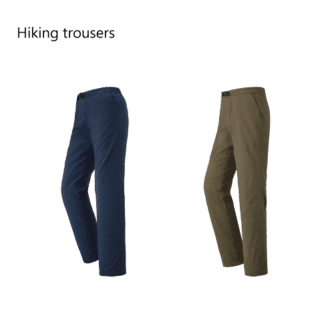 Pants made by strong and easy dry material, that helps your hiking trip comfortable. Relaxed fit generously allows for comfort and movement, avoiding any injuries in unstable and rocky terrain. 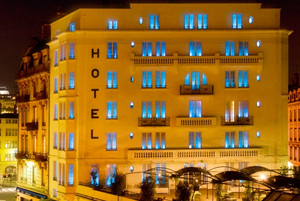 Here is the list that you have to prepare by yourself. Most of these item can be purchased at convenience store in Japan. If you cannot find them, please email us. Then we can introduce come places in Japan. Chemical fabrics and easy dry Shirt like excising shirt are comfortable. You will be sweat during your way to the summit, so it is more comfortable if the shirt has a quick dry function on its material or fabrics.Bring spare one packed in a plastic bag, just in case its all wet. Trekking socks is a little thicker than normal socks. It protect your tiptoe and heel with the thickness. The total duration for climbing Mt.Fuji is going to be more that 9 hours. The thick and supportable socks are helpful for your feet. Bring spare one packed in a plastic bag, just in case its all wet. How should I prepare clothing? 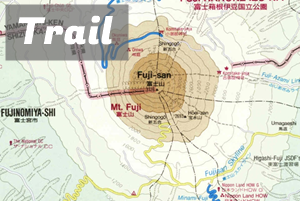 Would you like to learn more about your clothing in Mount fuji? We are explaining it with some photo on it. Click there link here: Check proper clothing for Mount Fuji trip.